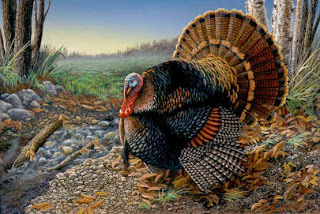 I found this beautiful painting by Rebecca Latham while I was searching for turkeys online. This particular painting is acrylic on panel. (the wild turkeys in my neighborhood don't look this good) I think this is a Hollywood Turkey! Don't forget to visit: "The Way I See It"